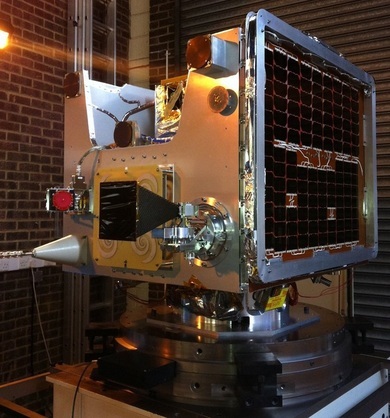 TechDemoSat-1 or TDS-1 is a technology demonstration satellite built by Surrey Satellite Technology Ltd. with participation of the UK Space Agency and a number of industry partners and institutions to create a spacecraft for the demonstration of innovative technology for scientific and commercial applications in space flight. 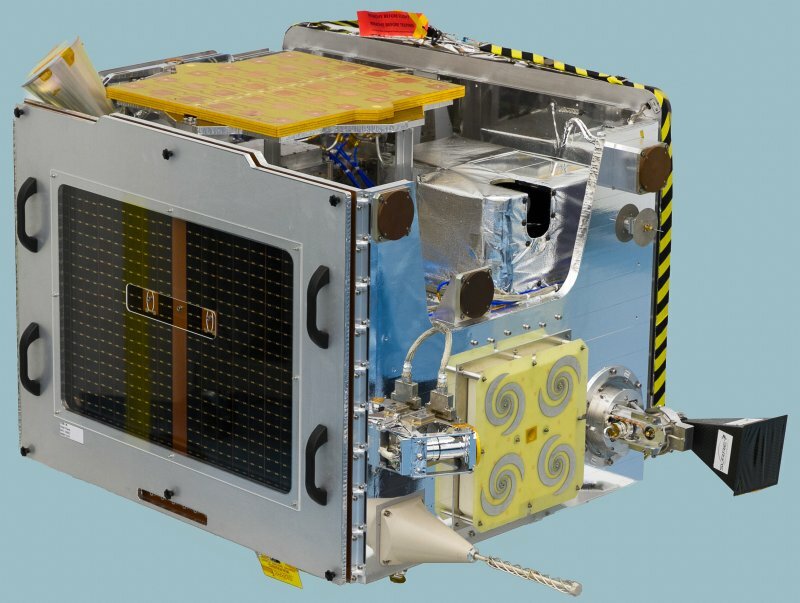 The satellite is based on Surrey’s SSTL-150 small satellite platform and hosts eight payloads that include a Sea State Payload, several Space Environment Instruments, a Sounding Instrument and three technology demonstrators for use in future spacecraft. The satellite bus can support payloads of up to 50 Kilograms with an external payload volume of 73 by 45.5 by 77.4 and an internal volume of 27.95 by 23.15 by 25.25 centimeters. 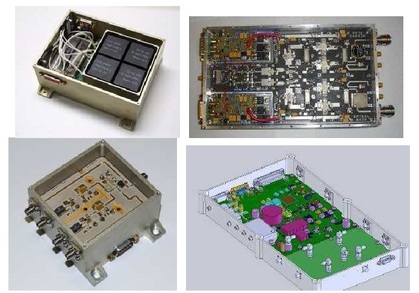 It consists of a stack of core avionics systems using a modular design that are supported by microtrays which add mechanical strength to the satellite and provide mounting structures for other satellite equipment. Internal panels are used to support the various subsystems of the satellite. Electrical power is provided by three body-mounted solar panels installed on three sides of the satellite for a total area of 1.15m². Located on the +x, -z and –x panels, the single-junction Gallium-Arsenide solar cells deliver an average power of 60 Watts at an efficiency of 19.6%. Peak power on the larger x-solar panels is 110W while the smaller z-panel delivers up to 55W. Power is fed to a 15 Amp-hour Li-Ion battery using Battery Charge Regulators to manage the state of charge of the battery. Power from the battery is passed to the Power Conditioning Module and Power Distribution Module that supply an unregulated 28V power bus and a regulated 5V bus and distribute/switch power to all satellite subsystems. The Attitude Determination and Control System of the Satellite uses a redundant set of sun sensors and magnetometers for coarse attitude knowledge and new Procyon star tackers for high-precision three-axis orientation knowledge. Procyon uses two optical heads and two Data Processing Unit with cross-strapping between the two strings for a high degree of redundancy. The optical heads use 60-degree baffles and are 9 by 11 by 11 centimeters in size plus the 14 by 16cm baffle. Procyon uses Active Pixel Sensors to achieve a field of view of 15 by 15 degrees and operates at an update rate of up to 4 Hz. The DPU is 15.5 by 21 by 5.6 centimeters in size weighing under 1.2 Kilograms while the optical head weighs 1.0 Kilogram. The system can acquire three-axis attitude data within eight seconds from power-on with an accuracy of 5 arcsec on X/Y and 50 arcsec on Z. The star trackers are integrated into the spacecraft data system via an CAN-SU or RS-422 bus. Procyon can recover from a lost in space mode, meaning that the star trackers can deliver attitude solutions without any prior attitude knowledge. The star tracker tolerates angular rates of 2°/s and accelerations of 1°/s². Attitude actuation is accomplished by using 100SP-M reaction wheels. 100SP-M reaction wheels are 109 millimeters in diameter and 101mm long with a mass of about 960 grams using integrated electronics that execute commands from the onboard computer. The reaction wheels spin at up to 5000rpm to deliver an angular momentum of 0.42Nms and a peak torque of 0.011Nm. Momentum management is provided by magnetic torquers. The wheels require a peak power of 10 Watts. The satellite uses a Hot-Gas Xenon resistojet propulsion system for a total delta-v budget of 36m/s. The system consists of a Xenon tank and resistojet thrusters that delivers a thrust of 10 to 100 Millinewtons operating in blow-down mode with an average impulse of 48 seconds. The 7.4-liter tank can hold up to 12kg Xenon at a pressure of 70 bar. Propulsion will be used for orbit adjustments and drag make-up maneuvers. Overall, the propulsion system weighs 19.4 Kilograms and is 23 by 30 by 30 centimeters in dimensions. TDS-1 uses an OBC750 onboard computer that is based on a BM PPC750FL processor. The OBC system is in charge of receiving and processing commands from Earth and controlling all satellite subsystems. 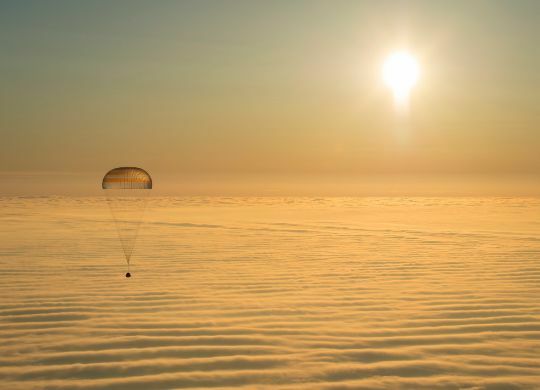 The system also receives all payload data that is stored and conditioned for downlink by the OBC. The computer has a memory of 6MB EEPROM (boot software), 256MB EADS, 16MB MRAM and 16MB Flash. It supports the 1553B high-speed data bus as well as two dual CAN buses, eight LVDS inputs and outputs, four opto isolated inputs and four opto isolated outputs. The OBC measures 32 by 32 by 6 centimeters and weighs under 2.5 Kilograms requiring 20 Watts of power during operation and 3W in standby. 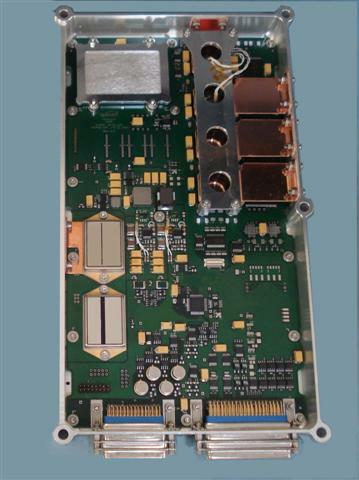 Payload data is stored in a 16GB High-Speed Data Recorder that supports 20 LVDS inputs/outputs at a data rate of 150Mbps, 5 SerDes inputs at up to 2Gbps and 16 LVDS outputs at 150Mbps. The system is 32 by 17 by 5.5 centimeters in dimensions at a mass of 1 Kilogram. Payload data is dowlinked via an X-Band terminal with two dual-axis Antenna Pointing Mechanisms to achieve data rates of up to 400 Mbit/s. The two-axis gimbal mechanism can be used to provide real-time imaging and downlinking capability – keeping the satellite pointed at a target while the X-Band antenna is locked onto a ground station. The system uses a circularly polarized horn antenna with a narrow-beam width and boresight requiring a high pointing accuracy of one degree. The system supports maximum slew rates of 20deg/s and is capable of focusing the radio frequency output into a high-gain spot-beam that is steered to track the position of the ground station by moving the antenna +/-114.7 degrees in elevation and +/-270 degrees in azimuth. Command uplink and housekeeping telemetry downlink is accomplished via an S-Band terminal. TDS-1 hosts a total of ten payloads that are part of a Maritime, Space Environment, Air & Land Monitoring, and a Technology suite. The SGR-ReSI is a Space GNSS Receiver – Remote Sensing Instrument to measure ocean conditions by GPS reflectometry. The expansion of the existing Global Navigation Satellite Systems (GPS & Glonass) and the creation of new constellations (Compass/Beidou & Galileo) has generated a wealth of space-based signal transmitters that are primarily used for navigation, but can also be used for a range of other purposes. GNSS occultation measurements for atmospheric measurements is a proven method for the acquisition of temperature, pressure and humidity profiles from high altitude to near-ground level. The science and methodology behind GNSS occultation measurements is well established and has been employed for many scientific projects as well as operational meteorology systems. Reflectometry of GNSS signals (using Earth-reflected GNSS signals to obtain information on land & ocean properties) has been proposed in the late 1980s for ocean sensing and in 1993 for ocean altimetry. The first experimental payload successfully detected reflected signals in 1998 and the first experiment dedicated to reflectometry was flown in 2003 (UK-DMC). The GNSS-R technology still requires work in a number of areas to optimize ocean sensing for wind and wave measurements, to verify inversion models, to improve atmospheric measurements for weather and research, and to demonstrate ice sensing and soil mapping. These needs will be addressed by SGR-ReSI. The SGR-ReSI payload uses heritage technology from SSTL, making use of previous experience with space-based GNSS applications. The instrument consists of eight RF front-ends divided in two groups – one optimized for operation in the L1 navigation frequency (Max2769) while the other (Max2112) can be re-programmed to any GNSS band – SGR-ReSI will use GPS&Galileo L1 and L2C or L5 GPS bands. The front ends interface with their associated processor boards with Field Programmable Gate Arrays (one flash-based, the other SRAM-based) with interlink to allow the exchange of data for storage of data from multiple front-ends. Data is stored in a 1Gbyte DDR2 solid state data recorder that interfaces with the reprogrammable co-processor and the SpaceWire data bus of the spacecraft. The instrument can operate in two modes – either acquiring short bursts of raw data that is directly stored in the Solid State Data Recorder, or using the co-processor to generate Delay-Doppler Maps as data products that are directly send to the spacecraft memory via Space Wire. Raw data would be processed into DDMs on the ground. Depending on the number of RF channels that are sampled, the instrument memory can hold one to four minutes of raw data. In contrast, the processed DDMs have a low data volume, allowing direct transmission to the spacecraft memory. However, raw data is needed for the verification of the inversion techniques via ground analysis. SGR-ReSI features several antennas – up to three zenith/side antennas which are single patch antennas for dual L1/L2c frequencies, and a 4-patch element nadir antenna with a gain of 12dBi to receive the weak reflection signals. The antenna unit measures 30 by 30 by 5 centimeters and the SGR-ReSI module is 30 by 18 by 4.5 centimeters in size with a mass of around 1.4 Kilograms. 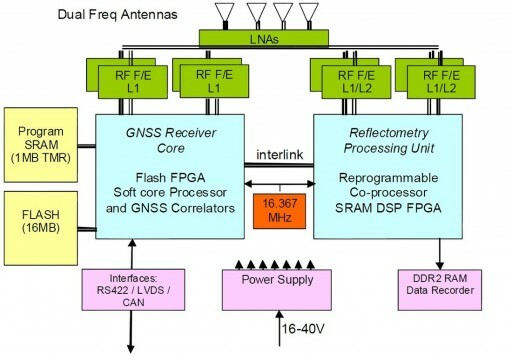 The core module is a 24-channel L1 receiver capable of supporting four antennas using a LEON3 processor and an Actel FPGA along with GNSS correlators plus a second FPGA that acts as co-processor. The zenith antennas are used to directly track and sample GPS signals and determine the ephemeris of the satellite to calculate the geometry between TDS-1 and the GPS satellite to obtain an estimate of the delay and Doppler of the reflection. Actual reflection data is acquired with the nadir antenna and synchronized to the direct measurements and put through Fast Fourier Transform algorithms and onboard processing to generate DDMs. The zenith-facing antennas can also be used for the standard GPS orbit determination as well as occultation measurements for atmospheric science, combining several instrument packages into one compact system. Overall, the system achieves a navigation accuracy of 5 meters in position, 10cm/s in velocity and 200 nanoseconds in timing. 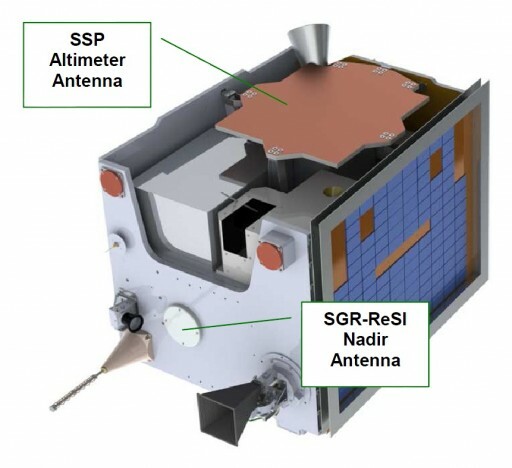 It is hoped that the SGR-ReSI payload will find operational application in ocean altimetry, ocean scatterometry, wave forecasting, sea air carbon dioxide flux tracking, ocean salinity measurements, ice edge mapping, ice and snow age sensing, tropospheric research, ionospheric mapping, plasmasphere sensing, and GNSS interference monitoring. 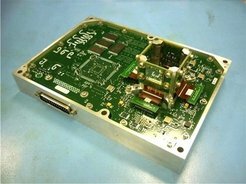 The SSP (Sea State Payload) Altimeter is an active altimeter payload for measurements by an experimental radar altimeter that is based on technology for the NovaSAR-S spacecraft that is being developed by Airbus Defence and Space. It uses one phase center of the NovaSAR-S payload along with RF technology developed for that project to demonstrate its performance in space with special focus on functionality and measurements, not the full operational performance. The Synthetic Aperture Radar Antenna pulses radar waves onto the ocean for the detection of the weak echo waveforms that provide valuable data on sea state. Sea state data can be used in meteorology, oceanography climate science and ice monitoring. The small radar antenna operates in the S-Band frequency and transmits chirp modulated pulses and records the deramped echoes as they are received – no onboard processing is employed. The overall DC power is 90 Watts and the peak pulsed power is 100 Watts. The radar operates at a pulse repetition frequency of 2kHz and a bandwidth of over 100 MHz. Data processing on the ground will yield Significant Wave Height measurements as well as Sea Surface Height and wind speed. MuREM – the Micro Radiation Environment Monitor is a compact instrument to deliver in-flight measurements of the Total Ionizing Dose, dose rate and charge deposition spectra of Single Event Upset initiating particles. It is designed to have a low mass, small size and minimal power consumption to become a generic radiation monitor for routine use on a range of satellite. The unit is just 10 by 10 by 4.5 centimeters in size and uses CubeSat-compatible interfaces for a possible re-flight. The instrument incorporates solid state dosimeters (RADFET – Radiation-sensitive Field Effect Transistor), dose-rate sensitive photodiodes and PIN diodes as well as a radiation effects board that allows the payload to gather collateral data on devices exposed to the space radiation environment. Each RADFET is comprised of two metal–oxide–semiconductor field-effect transistors (MOSFET) that have large-gate oxidizer layers to increase their response to the Total Ionizing Dose that can be detected as a function of gate threshold voltage. To make measurements, one MOSFET is kept at a biased current while the other is unbiased. A small current of 10 µA is passed through the MOSFET channels by using source and drain electronics. Changes in gate voltage are recorded as the voltage varies with the total accumulated dose that is also bias dependent leading to a greater variation on the biased MOSFET. The measurement in biased and unbiased MOSFETs is required to eliminate significant temperature dependency of the gate voltage. One of the RADFET systems of MuREM uses a copper-foil while the other uses an aluminum shield to study the effects of using these materials in spacecraft shielding. The photodiodes of the MuREM are used in a very simple setup. Their dark current is constantly measured and is known to vary with temperature and ionizing radiation effects. The temperature effect is linear and can be eliminated via calibration to only record the radiation effects that are quantified as part of data processing. The PIN diodes used for the particle detector are 300 µm thick and employ different sizes for their two purposes – the diode detecting heavy ions is 3 by 3 centimeters in size while the proton diode is 1 by 1 centimeter. Diode sizes have been chosen to account for the relative fluxes of the species. Energetic particles that travel through the diodes will deposit energy specific to their kinetic energy and species which is measured by 16 energy deposition channels spaced logarithmically. For heavy ions, energy ranges from 0.1 to 10MeV are covered while the protons of >30MeV can be measured. Up to 50,000 events per second can be recorded by the detectors. 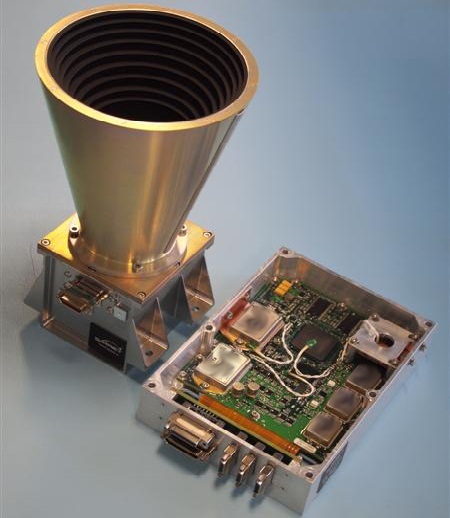 Another radiation payload is ChaPS, the Charged Particle Spectrometer which demonstrates four miniaturized detectors to combine the capabilities of multiple analyzers into a small system of electrostatic analyzers. The instrument can carry out simultaneous detection of electrons and ions for electrostatic analysis of different species in the LEO plasma environment. 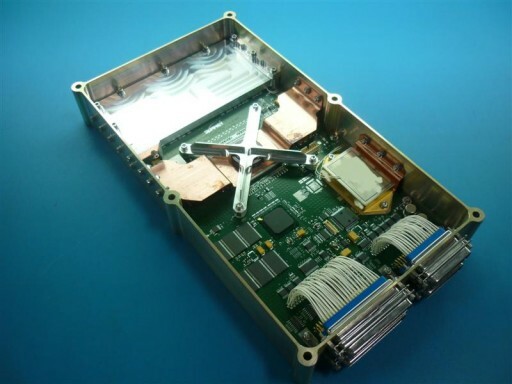 ChaPS uses a 1U CubeSat form factor and has the goal of demonstrating a potential sensor for future space weather constellations. The instrument has a field of view of 17 by 360 degrees and achieves an angular resolution of incoming particles of 17 by 21 degrees. The operational energy range begins at a few eV and extends to 20keV with an energy resolution of 0.22. The instrument weighs under 300 grams and requires about 0.5 Watts of power. 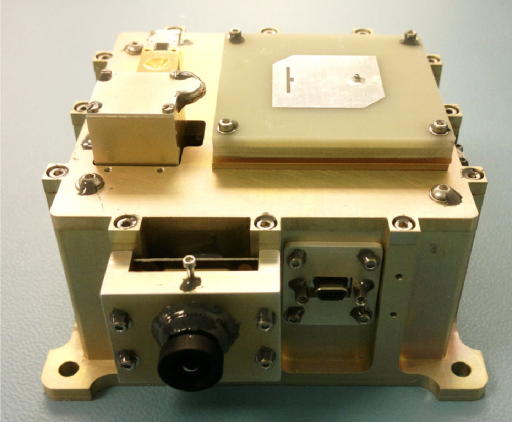 A third radiation monitor installed on the satellite is HMRM – the Highly Miniaturized Radiation Monitor developed at Rutherford Appleton Laboratory and Imperial College London. The system is an ultra-compact, light-weight unit that is capable of measuring total radiation dose, particle flux rates and particle species. HMRM could be a future sensor for a variety of satellites to deliver housekeeping data for spacecraft to correlate onboard performance with the radiation environment and to provide warnings during periods of increased particle flux. The instrument weighs 52 grams and is 20 by 25 by 30 millimeters in size, requiring 1 Watt of power. HMRM uses a metal hosing to provide shielding except for a small entrance aperture that guides particles onto the detector. It uses an active pixel sensor stack as a detector employing 0.18 µm CMOS pixels. The sensors are 50 by 50 pixel arrays, 20 by 20 millimeters in size. Data is captured at 10,000 frames per second with digital read-out. The instrument can measure the radiation dose, the dose rage and obtain particle spectra for electrons from 0.06 to 6MeV and protons from 1 to 500 MeV. LUCID – the Langton Ultimate Cosmic ray Intensity Detector is a project of Langton Star Center at the Simon Langton Grammar School for Boys. The payload was developed by students at the ages of 16 to 18 using technology provided by CERN. 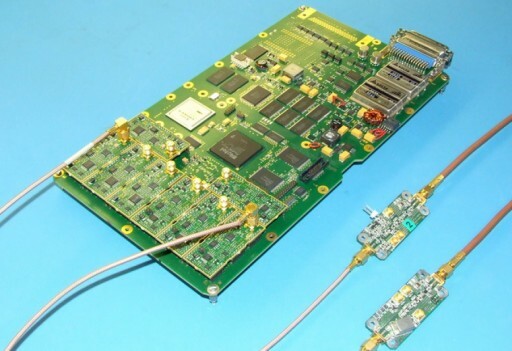 The instrument uses five chips from the Medipix series as a cosmic ray detector. This project primarily provides an opportunity for students to engage in a space-science mission and associated cosmic ray research. The detectors that are employed are silicon-based photon-counting pixel detectors that allow the determination of the energy, type, intensity and directionality of high-energy particles. The detector area is about 2cm² hosting 65,536 pixels allowing for high time-resolution imaging of particle events. A single Air and Land Monitoring payload is hosted on TDS-1, the Compact Modular Sounder, CMS. The instrument is a modular infrared remote sensing radiometer that is 38 by 32 by 19 centimeters in size with a mass of four Kilograms. It consists of a telescope, a scan&calibration mirror, a cold sky calibration target, an optical system comprised of relay and filter optics and an infrared detector array with associated read-out and conversion electronics. The scan mirror selects a field of view of Earth, the limb of Earth or deep space. In standard operations, the instrument switches between the nadir mapping view to the space view and to the cold calibration target. Limb viewing is used for instrument calibration. The system uses a modular approach designed to easily mix subsystems to fly different versions on multiple spacecraft platforms at low cost by tailoring the instrument to specific spacecraft requirements. 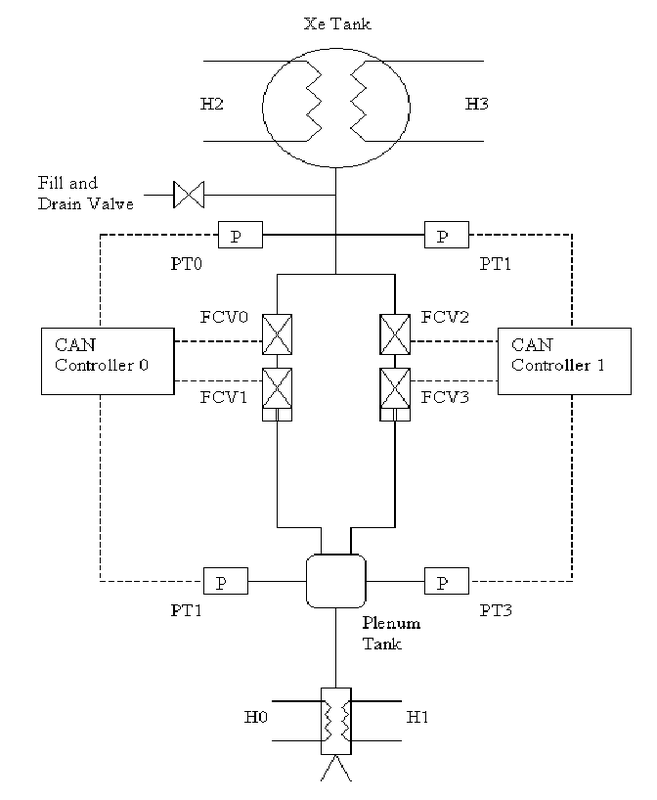 TDS-1 demonstrates a Hollow Cathode Thruster system (HCT) as a propulsion system for small spacecraft in Low Earth Orbit. The system consists of a Hollow Cathode Thruster, a Flow Control Unit and a Power Processing Unit for a total payload mass of 1.5 Kilograms. HCT uses field enhanced thermionic emission for spacecraft propulsion by heating a hollow cathode to 1,100°C, creating free electrons that are collected by the anode walls. Xenon propellant is then supplied from the plenum and travels to the cathode. The Xenon is ionized by the electrons emitted from the cathode creating an internal plasma. This internal plasma inside the HCT is formed between the cathode and anode electrode that is kept at a positive voltage with current drawn from the cathode via the plasma. Once initiated, the discharge is self-sustained and ions are pulled out of the discharge chamber via the ion optics consisting of positive and negative grids. The ion beam that is created delivers a specific impulse of up to 85 seconds at a low Xenon flow of 20cm³ per second. The system requires 60 Watts of power during operation. 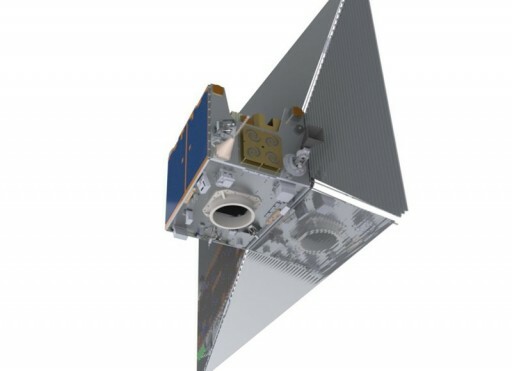 TechDemoSat-1 will demonstrate a Deorbit Sail DOS developed at Cranfield University as a novel means for de-orbiting satellites at the end of their mission by deploying a large sail to increase the surface area that is subject to aerodynamic drag in the uppermost layers of the atmosphere. The sail consists of 25 µm thick Kapton with support struts that interface with the spring-loaded deployment mechanism. Deployed via cable cutters that allow the sail to spring into place, DOS will unfold once the primary mission of the satellite is complete. After unfolding the sail, the satellite will enter an attitude to maximize drag and solar pressure to speed up the rate of its orbital decay. Decay rates before and after sail deploy will be compared and different spacecraft attitudes will be tested to determine the effect of the sail on drag and decay rate. 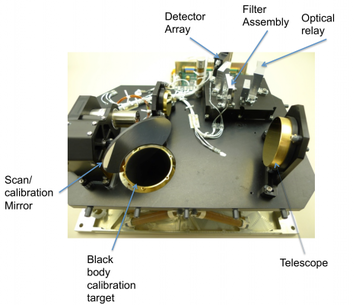 As a final payload, TDS-1 hosts a CubeSat Attitude Determination and Control System demonstrator centered around a miniaturized stellar gyroscope which is capable of propagating a spacecraft’s attitude by tracking the movement of stars between two frames acquired by the optical imager. 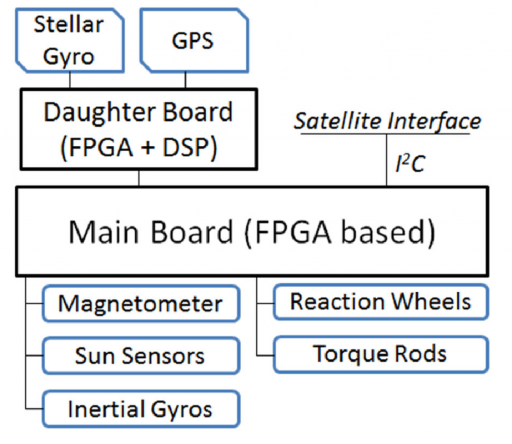 Adding a stellar gyroscope to an attitude determination system that consists of an inertial navigation platform can reset the drift of the rate gyros and increase the accuracy of attitude knowledge. Using only gyroscope angular data that is always associated with a drift will result in a loss of attitude knowledge after a sufficient amount of time. Adding star trackers or Earth horizon imagers to correct the drift adds cost and/or complexity to the systems while a stellar gyroscope is a cost-efficient and robust device. 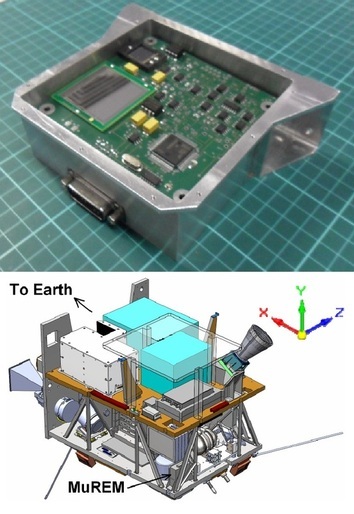 The demonstration payload includes a complete Attitude Determination System for a CubeSat spacecraft with associated electronics and data processing equipment to allow an assessment of the performance of the integrated system and not only the stellar gyroscope. The ADC consists of a magnetometer unit, six coarse sun sensors and MEMS Inertial Gyroscopes alongside the stellar gyroscope which only operates in eclipse to reset the drift on the MEMS gyros. During illumination, the satellite acquires attitude knowledge with the sun sensors that have an accuracy of 0.5 degrees and the magnetometer that generates field vector measurements on three-axes at an accuracy of one degree using GPS data for the calculation of the position in its orbit to compare its measurement with a magnetic Earth model. The stellar gyroscope uses an 640 by 480 pixel CMOS Sensor from OmniVision with a focal length of 6mm and a field of view of 27.6 by 36.7 degrees. The pixels are 6 by 6 micrometers in size and the imager can detect stars at magnitude 4 or brighter operating at exposure times of 800ms. The imager is not equipped with a baffle since it only operates during orbital night.